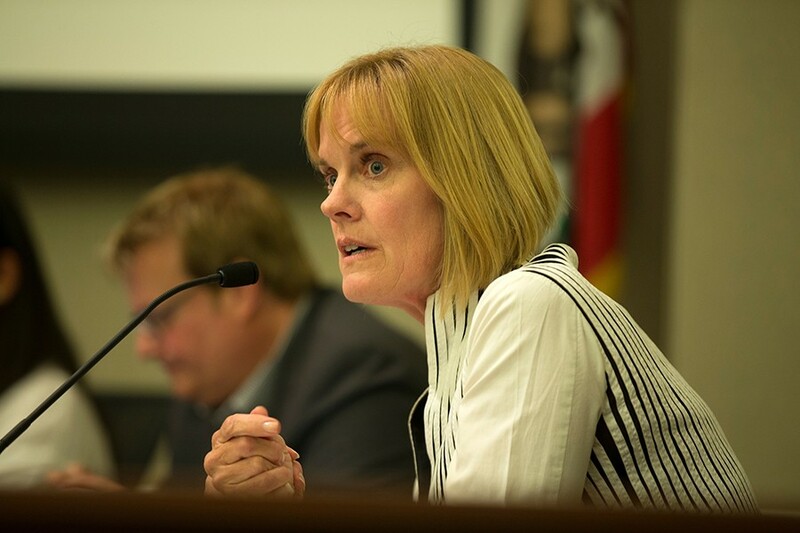 Alameda City Manager Jill Keimach declared war on the city council earlier this month. Critics say she knew beforehand that her job might be in jeopardy. The council's dissatisfaction with Keimach appears to predate her fire chief choice. On an early August night, as residents throughout Alameda were welcoming city officials and local police for neighborly conversations at annual National Night Out events, the seeds of the city's biggest political controversy in years were sowed. Alameda Police Paul Rolleri alleged that in a conversation with Alameda Councilmember Jim Oddie that night, Oddie threatened the employment of City Manager Jill Keimach if she did not select the firefighters' union's hand-picked candidate for fire chief. In a memo from Keimach to the Alameda City Council, dated Oct. 2, the city manager also accused two councilmembers of exerting pressure on her to hire Domenick Weaver, a 22-year veteran of the Alameda Fire Department and former firefighters' union president. Keimach suggested that the meeting violated the Alameda City Charter, which forbids councilmembers from interfering in the day-to-day operations of the city. Last week, the Alameda City Council voted 5-0 to hire an outside investigator to probe Keimach's claims and agreed to postpone her pending job review. Malia Vella, who allegedly was one of the two councilmembers who met with Keimach (the other allegedly was Oddie), said she welcomed the investigation and asserted that she will be exonerated. The claims by Rolleri and Keimach have reignited a battle between the powerful International Association of Firefighters (IAFF) Local 689 and those on the island who dislike the union's political influence and argue that firefighter retirement benefits are a drain on the city's treasury. During a council meeting last week, critics of the firefighters slammed the union, Vella, and Oddie. But union supporters maintained the controversy is not about the hiring of a new fire chief, but rather, Keimach's job performance. Critics contend that Keimach decided to go on the offensive when she realized her employment might be in jeopardy. Detractors say she has dropped the ball on several issues recently, including engaging in nasty negotiations with the nonprofit running the city's animal shelter; mishandling a water contamination incident at Alameda Point; and directing an allegedly faulty hiring process for the new fire chief. "It's obvious to me that this whole investigation is a bad management ploy to divert attention from the city manager, who hasn't been doing a good job," said Alameda school board member Gray Harris at a council meeting last week. (Harris is also married to Local 689 President Jeff Del Bono.) "To me, it's clear you thought you were going to get fired, and, therefore, you're directing this onto the council so they won't do your review." The controversy even drew Democratic Assemblymember Rob Bonta into the fray. In an interview, the longtime Alameda resident and strong union supporter alleged that Keimach's claims are a "play out the city manager playbook, at least in Alameda: If you think the facts are going to come out against you, the best defense is a good offense." Keimach responded that her job performance wasn't an issue until there were signs that she wouldn't pick the union's choice for fire chief. "This issue begins and ends on my responsibility to select the best candidate for Alameda's next fire chief," she said. "Many agreed with my decision to hire Chief Edmond Rodriguez, including many in the fire union. I have enjoyed stellar performance evaluations over my 30-year career, until it became clear that I may not select the fire union's candidate for fire chief." But the timeline of the fire chief selection process appears to run counter to Keimach's assertions and reveals that the council's dissatisfaction with her predated her decision not to hire Weaver. For example, Oddie's alleged comments to Rolleri occurred about a month before Keimach identified her top three candidates for fire chief. Also, Weaver was one of the three finalists, and there was no indication in August or in early September that Keimach wouldn't select him. Also, according to Alameda officials, city consultant Rod Gould, who was hired to assess the council's views of Keimach and her job performance, sent a draft copy of his work to Keimach on Aug. 20. According to City Hall sources, the council's assessment of Keimach was not positive. Gould, who is a former city manager of Santa Monica and San Rafael, then abruptly quit on Sept. 28. In an email to the Express, he cited "irreconcilable differences" with the council for why he left. In late September, Keimach had still not announced her fire chief pick, when Weaver stated in a letter to the city manager that he was pulling his name from consideration, writing, "Never before have I been witness to a more unprofessional selection process." Keimach wrote her letter making allegations against the council on Oct. 2 and the next day announced that she had tabbed ex-Salinas Fire Chief Rodriguez. This is not the first time an Alameda city manager has gone to war with her bosses: the city council. In 2010, then-Acting City Manager Ann Marie Gallant accused then-Councilmember Lena Tam of illegally sharing confidential emails with an Alameda Point developer. Gallant also turned the case over to the Alameda County District Attorney's Office. Progressives and labor supporters responded by rallying around Tam, and no charges were filed against her. The controversy ended up costing Gallant her job after a progressive majority that included Bonta took control of the council. Gallant later sued the city, but the city ultimately prevailed. The current controversy, meanwhile, flared when Rolleri told East Bay Times columnist Daniel Borenstein that Oddie allegedly suggested to him that Keimach's job was on the line if she didn't pick Weaver. Rolleri's move was highly unusual; it's rare for a police chief to publicly accuse a councilmember of violating a city law, particularly when the issue doesn't involve the chief's department. Rolleri declined to comment for this story, as did Oddie. Borenstein's column and a subsequent unsigned editorial also accused Vella of improper interference, although neither offered direct evidence of her wrongdoing.